A stunning tale of suburbia's darker underbelly by the critically acclaimed author of I Wanna Be Your Joey Ramone, Stephanie Keuhnert. Ballads are the kind of songs that Kara McNaughton likes best. Not the clichéd ones where a diva hits her dramatic high note or a rock band tones it down a couple of notches for the ladies, but the true ballads: the punk rocker or the country crooner reminding their listeners of the numerous ways to screw things up. In high school, Kara helped maintain the "Stories of Suburbia" notebook, which contained newspaper articles about bizarre, tragic events from suburbs all over America, and personal vignettes that Kara dubbed "ballads" written by her friends in Oak Park, just outside of Chicago. But Kara never wrote her own ballad. Before she could figure out what her song was about, she left town suddenly at the end of her junior year. Now, four years later, Kara returns to her hometown to face the music, needing to revisit the disastrous events that led to her leaving, in order to move on with her life. 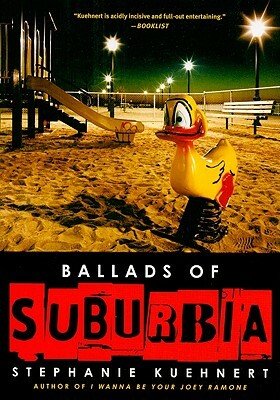 Intensely powerful and utterly engaging, Ballads of Suburbia explores the heartbreaking moments when life changes unexpectedly, and reveals the consequences of being forced to grow up too soon.